One of the top hotel and golf options in North England, Oulton Hall is the epitome of countryside opulence, with 27-holes of outstanding golf on-site. Dave Thomas’ championship design is widely regarded as one of the finest layouts in northern England, the course overlooks the characteristic hills and dales of Yorkshire and is both a pleasure and a challenge. Located just outside of Leeds, Oulton Hall is within easy reach for the majority of UK golfers. Set in a beautiful 18th-Century building, you can feel the quality of the place from the moment you arrive. Guests will enjoy a state-of-the-art spa, health club, gorgeous landscaped gardens and a drawing room as well as two fantastic restaurants. As you would expect, Thomas's layout takes in the natural undulations of the land, but he has used the inherent features of the landscape to create hazards. The greens are very subtle, a feature of the designer's ability to create a good challenge, whilst retaining the course's playability for golfers of all standards. 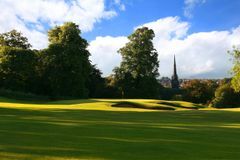 Adding to Oulton's golfing repertoire is the 9-hole Hall course, which may not be long, but it will be an enjoyable experience for all those who visit on a golf break. The investment programme has encompassed the clubhouse, which is now a superb two-storey facility with a restaurant and excellent corporate banqueting capabilities. Oulton Hall is the only 5* golf resort in the north of England, and is currently benefitting from a £7.5 million investment programme. This will only serve to confirm the quality on offer at Oulton Hall, whose Grade II listed mansion is a truly stunning construction. It has been sympathetically converted to boast 152 guest rooms, including 12 deluxe, and 7 suites. The building itself may be traditional, but the fittings and furnishings of the bedrooms are contemporary, ensuring that visitors receive the best of both worlds. The surrounding gardens are expertly trimmed and manicured, testament to the attention to detail that allows Oulton Hall to stand apart as a destination for a golf break in the north. The newly refurbished leisure complex features a sublime swimming pool, a steam room, sauna, gymnasium and aerobics studio. For something a little more sedate, there are a number of health and beauty treatments on offer. The excellent Brontë Restaurant has been recognised with an AA Rosette, and serves superb French and English cuisine. The Blayds Restaurant offers diners something a little more informal throughout the day. My only slight criticism is that we were not informed upon booking that it would be advisable to book your table in the restaurant of your choosing(Al A Carte or Clubhouse) though both dining experiences were excellent. Good hotel with lots of facilities and comfortable rooms. Reception staff not the most helpful and seemed unaware of eating options and couldn't make booking for dinner so we had to do it ourselves. However for a golf trip such as ours its well worth considering. The Hotel facilities and rooms are top quality - but each time I have been (this was the third time) little things seem to go wrong. This time it was double bed configurations in our three twin rooms and our booking for 20:30 for dinner didn’t seem to have been auctioned. Both of these were on our booking confirmation and acknowledged by the reception staff as being booked. Thoroughly enjoyed the Lay out off the 3 x 9 Hole Courses with some fantastic holes. We played here many years ago but it wont be that long again before we return. Greens a little uneven on our first day but thereafter no problem. Pro shop staff very pleasant and helpful with a good range of products available. Fairways lacked some distinction but it was late Sept early Oct so perhaps not surprising. Bunkers vary quite a lot and could be better but overall an enjoyable three days. For the time of year the course was in excellent condition and the greens although tricky were a good test.